Without one kind of uniform, retired Army Gen. Ray Odierno's not sure whether he'd have put on the other. "Frankly, if it wasn't for football, I don't know if I would've gotten the opportunity to go to West Point," said Odierno, the former Army chief of staff who last month was named chairman of USA Football. "Football's played such an important part of my life, in my development. I wanted a way to give back, and for me this is an important way to give back." The organization offers safety, player development and coach certification programs for all ages and types of gridiron play, including flag football and " modified tackle" games for younger players. The latter have been expanded and developed, respectively, to address safety concerns and increase participation. A 2016 report from the Sports & Fitness Industry Association showed a slight uptick in youth football play in 2015 from the previous year, but not enough to combat an overall decline in recent years: USA Football claimed 2.8 million youth tackle (ages 6-14) participants in 2013 news releases, but now puts the figure at 2.2 million. In light of those numbers, Odierno said he's aiming to promote the game as well as address safety concerns in his new role. "I think it's important for youth to have options," he said in a Tuesday phone interview. "I want to make sure that football remains an option." Odierno's links to the game go well beyond a West Point gridiron career cut short by knee injuries. While chief of staff, he worked with NFL commissioner Roger Goodell to coordinate Army-NFL efforts to combat traumatic brain injury. 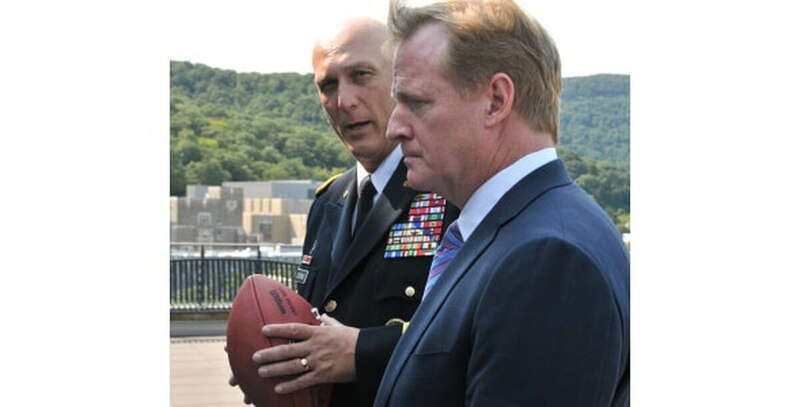 Goodell eventually would pitch the USA Football job to Odierno; thanks to the game's place in the general's upbringing, it didn't take much convincing. "I feel fortunate I had the opportunity to [play] at a young age," said Odierno, who recalled beginning his own tackle-football career around fifth grade. "You know, there's nothing more challenging for a young man, at that age, [than] to do something physical. And that's the first time you get challenged physically, whether it's blocking or tackling. That's important to your development, and it's done in a very controlled way." 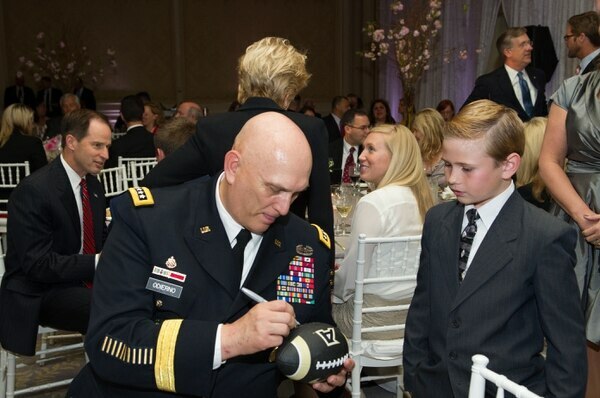 Then-Army Chief of Staff Gen. Ray Odierno signs a football for James Nathaniel "Nate" Richards, the 2012 Navy Military Child of the Year, during a 2013 gala in Arlington, Va.
Odierno also credits the game for developing leadership skills. Much of his time as senior adviser to JP Morgan Chase, he said, involves offering leadership and team-building advice, a good chunk of which can be found on the gridiron. "You have 11 men on an offense or a defense. In the Army, we have nine-man squads. And they're very similar," he said. "You have to depend on the person to your right or left. You have to depend on them to know their job. … The sum of the parts is greater than any single entity." Odierno will be the second recent four-star general to take over a sports organization in retirement. Army Gen. Martin Dempsey, former chairman of the Joint Chiefs of Staff, was named chairman of USA Basketball late last year. Both West Point graduates finished out their careers during a 14-game football losing streak to the Naval Academy, one finally broken in 2016 after both had left service. "For me, it's one of the hardest things we ever went through, to be honest with you, especially having been a football player at Army," Odierno said. "It was like having a cloud over your head for 14 years, 15 years. It was horrible. "Part of being in the military is being part of winning. If you're losing all the time, we're teaching the wrong element. … To watch this year, and to watch us finally break that horrible streak, was one of the most satisfying things I've seen in many, many years. And it's not about Navy, it's just about all the service academies, that we're all competitive, that people understand we're competitive, and we'll play above our heads. We'll be competitive with some of the best teams in the nation, not every Saturday, but on any given Saturday."